A cookie-like cake, on the other hand, is apparently welcome. I didn't realize how acceptable, nay, amazing such a creation would be until now. I found a recipe for oatmeal raisin muffins that I felt had the potential to make interesting and unique mini-loaves and I was right. 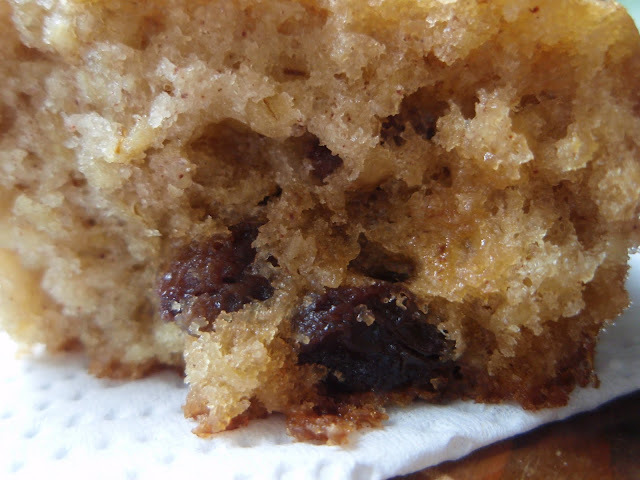 Yes, the texture was enjoyable (hearty yet still fluffy and light) and the preparation couldn't have been simpler, but what excited me most of all was that the stuff that came out of my oven tasted exactly like an oatmeal raisin cookie. It's the little things, folks. The little things. Combine the oats and buttermilk in a large bowl and let stand about 30 minutes. Preheat the oven to 400ºF. Spray or line your baking vehicle of choice. Add the eggs to the oatmeal mixture one at a time, whisking thoroughly after each addition. Whisk in the sugar, then the butter. In a smaller bowl, combine the flour, baking powder, salt, baking soda, cinnamon, and nutmeg. Fold this dry mixture into the wet ingredients. 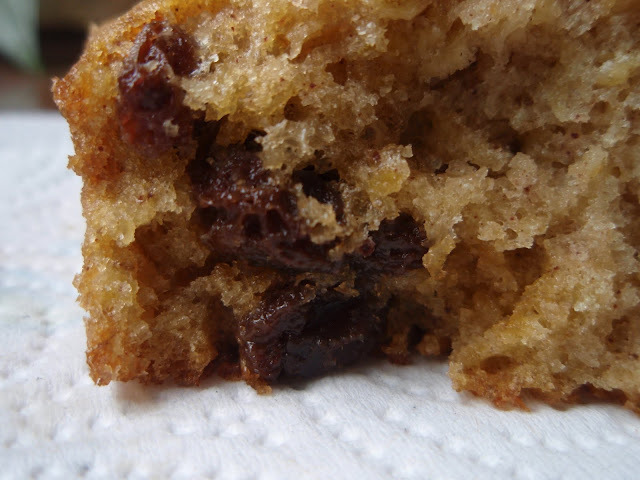 Once the flour is dispersed, but not completely moistened, gently stir in the raisins. Divide the batter evenly between the molds. Bake until a toothpick inserted into a muffin comes out clean, 25-30 minutes for mini-loaves or 13-18 minutes for muffins. Chewy cookies are wonderful and that cake looks gorgeous! Agree totally with your cookie preferences. No cakey cookies, thank you. But a cake-cookie? Bring it on. Yes, please, for breakfast now instead of the grapefruit I'll probably eat. Thinking these would be perfect for my muffin top pan. Like your perfect cookie, I'll bet. Love the oatmeal in the mix. Yum. I love this innovation in oatmeal cookie-dom! The texture looks perfect, and I like seeing the oatmeal in there. I love oatmeal cookies so I am going to love these! Yes to the chewy cookie with the crispy rim! Yes to these lovely loaves with oatmeal, cinnamon goodness! No to the raisins....sorry, I really don't like raisins baked in my sweets, but I could sub chocolate chips. Yummmmmm I so love the idea of a cookie like cake!! so a coouffin. a cookuffin. there we go. however to phrase it, i would do the same thing. I'll be making this (without raisins, of course) with the addition of chocolate chips. The girls will love it! I'm not a cakey cookie fan either, but I bet I would love cookie like cake. Looks awesome! Cookie cakes sound like a total win to me! Mmm.. that does sound super scrumptious! I like my cookies the same way so I am sure I would like this cake. You've done it yet again Grace... you made me drool. Now I want cookies and cake. I never thought it about that way but you are so right! Cake-like cookies? Nay. Cookie-like cakes? Yay! I like my cookies the same way so this recipe is a must! Except I may have to sub the raisins for chocolate chips. Oh Grace, I already bookmarked this one! Love the texture of the cookie...cake like :-) I'll definitely try and will let you know. Mmmmmmmmm. That is all. and also mmmmmmmmmmmmmm! A cake that tastes like a cookie? Yes, please. Yeah, see, you had me till you mentioned raisins. How about chocolate chips instead? Holy smokes does this look good. We LOVE oatmeal cookies......we love chewy oatmeal cookies, not cakey cookies...but....oatmeal cookie in a cake? Ohhhhhh yeah-I can't WAIT to try this! Hmmm! That's so interesting.. I'm a huge fan of "cookie cakes"... like a giant chocolate chip cookie with frosting decoration. Popularized, I believe, by the one and only Mrs. Fields. But I've never thought of a cookie cake with actual cake-like texture like the one you have here. So creative, you are, Ms. Grace!! Wow, a cookie/cake must have been delicious. You always come up with delicious and unique recipes, Grace. I'm with you 100% on chewy cookies -- in fact, I like them so chewy I actually prefer the dough to the cookies. :) (Not great when it comes to raw egg, I know...but sometimes a girl can't help it. ;) ) Anyway, this cookie-like cake looks amazing! I am a chewy girl too. I love that these have buttermilk in them. Buttermilk seems to always kick a recipe up to perfection. Cookie-like cake - what a wonderful idea!! I am completely with you on that one - chewy cookies all the way! Cakey cookies be damned! A cake that's like a cookie? - spectaculaaarrr! I think this one is for Ingrid since she doesn't like to bake individual cookies. I'll have these with craisins and of course throw in some chocolate too! Cookie cake is a good thing! Grace, you had me at cookie! Another bookmarked recipe...you temptress you. Your cake certainly "talks" to me! Looks wonderful. Cake, muffins, cookies? I'm getting confused just thinking about it. Although if it were up to me, I'd use chocolate chips instead of raisins. A new and delightful invention! What an idea Grace. Well said, Grace. A cookie cake is a great idea, I love chewy too. I'm loving the sound of this recipe! I share your staunch opinions about cookie texture. That cake looks great, too! Im with you! Chewy all the way! Oh, sounds nice! It's always good to find alternatives for cookies (I find it much easier to eat just one piece of cake than eat just one cookie!). Did you say cookie-cake? Please bring two, as I quite easily might eat a whole one myself! Now that I've finally made oatmeal raisin cookies of my own, an oatmeal raisin cake?!? I'm on it. Right now. I live for cookie-like cakes! I also love oatmeal cookies so I am goona love this ,...pure delciousness! oooooooo:) A cookie-like cake sounds quite intriguing. I think you should "patent" it!!! This looks like a good recipe for my foods students at school. Thanks for it! It will be fun for us to try together. I'm all in! Oatmeal raisin are my daughter's very favorite cookies. She'd be thrilled with this recipe. I love chewy cookies :)Absolutely delicious! Like you need another comment.... But OMG - I am so licking my screen here. Delicious! Y-U-M-M-Y! I love chewy cookies as well but my kids hate them. They prefer the crispy ones. Whenever I bake cakes, I'd take my out early and leave the rest in longer for my kids. This is my kind of cake! Cookies/cakes combination, I like that sound. Instead of having a slice of cake or a cookie, I can have both at one bite. Very clever Grace. Is it a cookie? Is it a cake? Is it a muffin? Who cares! It sounds delicious. Lots of cinnamon, of course. I think you must buy it by the truckload! What a great idea - I would gobble it right up :) And I'm with you on not being a huge fan of cakey cookies - they're too healthy almost. Yum! And somehow the upgrade from muffin to cake makes it go from breakfast to dessert. Or is that dessert for breakfast? I could do that, too. There's a pretty fine line between muffins and cakes, isn't there? Whatever it is... cookie-ish, cake-ish... it looks yum! Oh, how perfect! I LOVE spicy oatmeal desserts. And I'm totally with you on chewy cookies -- if I wanted a cakey cookie, I'd eat a cake. Maybe this cake! Ooh... I think I would enjoy a cookie-like cake! I feel the same way about my cookies as you do. I love when you're expecting good and instead what comes out of the oven is GREAT! The reverse though stinks....a recipe's hyped up so much that when you make it it is disappointing.